Hyderabad: Sunrisers Hyderabad skipper Kumar Sangakkara feels keeping the Sri Lankan players out of the Chennai matches in the sixth edition of the Indian Premier League is not going to “curtail” the spirit of the game. Bowing to intense political pressure, the IPL governing council last week withdrew top Sri Lankan players from all the Chennai matches of the high-profile IPL after Tamil Nadu chief minister Jayalalithaa refused to host them in view of the prevailing anti-Sinhalese sentiments in the state. “Politics in this case has affected/restricted our presence, our belief to play in every part of India. But I don’t think, sports and spirit of cricket is ever going to be curtailed by such prejudice,” he said on the sidelines of an event here. The Lankan great was reacting to a query if politics has affected the participation of Sri Lankan players in Chennai. “The build-up has been different and difficult for Sri Lankan players. But at the end of the day, they are here to play IPL. 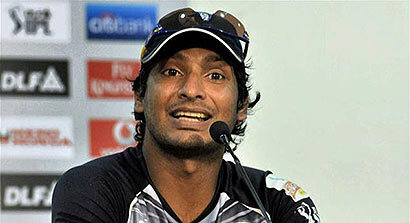 The Sri Lankan Cricket Board has made it clear that no Sri Lankan players will be [playing] in Chennai,” Sangakkara said. Kumar, good you have good brains. The other idiots, cant tell a myth from fact. Show fro acting. They hide under religion, distort religion, distort race and are stooges of politicians. What do you mean by Spirit….????? Alcohol…..??? or surgical spirit…? Does anyone play games for NO MONEY…? or to be a SAINT..?